Today is a big day for all Predator fans. adidas have today introduced the Predator 18+, which is the re-launch of one of the world’s most iconic boots. The Predator 18+ replaces the ACE and is a part of the coming Skystalker Pack. Check out the modern version of the legendary Predator here. It’s back - happy Predator day! 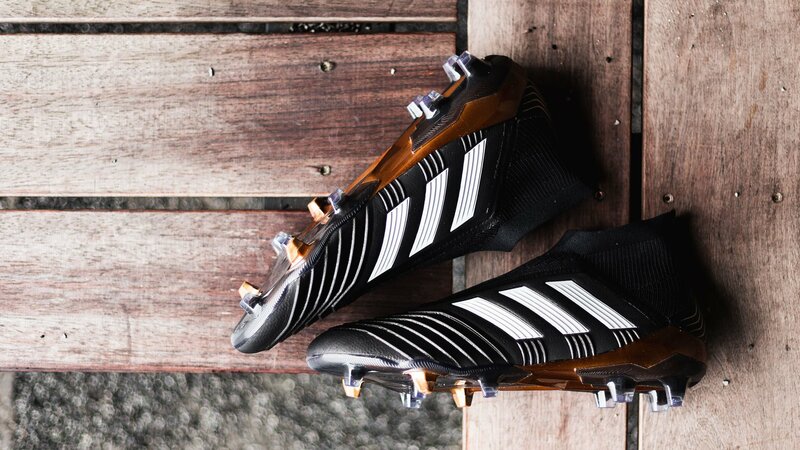 Today is finally the day, where the adidas Predator gets its comeback. The new model is called adidas Predator 18+ and will with immediate effect replace the ACE 17+ PureControl in all adidas launches. This means it will be part of the forthcoming Skystalker Pack, but before we reveal the other 4 boots, the Predator deserves its time in the spotlight alone. The Predator was first launched back in 1994 and worn throughout the 90’s and 00’s, it was stars like David Beckham, Zinedine Zidane and Del Piero, who created history wearing the Predator silo. Now adidas bring their most iconic boot into 2018 with the Predator 18+ and here it will be superstars like Paul Pogba, Dele Alli and Özil, who will wear the new innovation. You can already order the adidas Predator 18+ and 18.1 from today. Find your pair right here. The first ever colourway for the Predator 18+ is a captivating black, red and gold piece, which gives you a classy and stylish feel, but still has plenty of flare in the shape of the chromed up soleplate and hidden details. It truly is a perfect combination for the controlling player, who runs the game and structures every attack. If you look at the technology behind the Predator 18+, and what ways adidas have innovated and improved the boot, it is particularly worth noticing adidas’ Primeknit Sockfit. It is created to expand and fit your foot shape and ensure the ultimate supportive fit. The Primeknit material includes a layer of Controlskin for optimal grip in all weather conditions, as well as an anatomical upper, which follows the heels shape and ensures lockdown throughout the boot. adidas’ famous PureCut laceless system has been carried over from the ACE PureControl boots and still works to maximise your strike surface, which in turn increases pass precision and shot precision. Built into the boots upper you find the Controlframe, which is what makes the laceless fit possible. It supports your foot and provides both horizontal and vertical support, when you move and make sharp turns. Lastly, adidas have built on their Boost concept and built it into the sole, which gives you more energy return when you run. All in all the adidas Predator 18+ is the optimal weapon for any playmaker, who demands luxury boots. With the boot you can tap into legendary players mantra, while enjoying adidas’ newest and most innovative technologies. Predator is finally back and it has come to stay. Thank you adidas! Are you just as hyped for the rebirth of Predator? You can order your pair of adidas Predator 18+ and 18.1 right here.